This is the first time I have been back to Sweden for 30 years, seems crazy that it was that long ago. We had good intentions of returning several times and showing the kids their roots but got waylaid by a travel deal to America and ended up doing LA, Vegas, Mexico and New York instead. 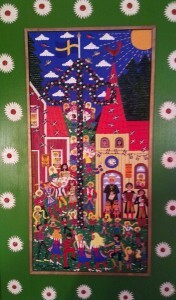 This painting of Swedish Midsummer celebrations was bought by my aunty Lillian at an art exhibition in Sweden organized by my USA Art Gallery. Oh well, finally my husband and I are here the kids were too busy with uni to make it this time, and being in Sweden fills me with mixed emotions too. It is both exciting and scary to revisit your home country, my thoughts go to the people no longer alive particularly my 2 sets of grandparents whom I loved so very much and miss every day still. Coming home to Sweden feels melancholy without them here. Then there is the other relatives that I have missed too and the times and get-togethers – birthdays, Christmases and parties. Over the years I often felt regretful and sad to miss out and imagining how they cherished each other’s company and fun. So it is with very mixed emotions that my childlike view of the world is brought back to reality when I find out that in many cases even though they live in relative proximity to each other some of them have not seen each other since I was home last 30 years ago! And no they are not fighting or dislike each other from what I can see they just simply got on with their lives and time slipped away. Over a series of 9 days travelling from Gothenburg – Sundsvall – Stockholm we gather together with both my mothers and fathers side of the family and have many lunches and dinners and catch ups. I felt so blessed to be within the bosom of my longed for family, at all times I felt cherished and loved and the misapprehension and melancholy soon lifted. The first gathering in Gothenburg started at 11 am and did not conclude till 11pm with lunch, dinner with coffees and snacks in-between some fine wine. The company was wonderful with Lena, Leif, Emma who we are staying with, then joined by my 82 year old aunty Actress and Director Gun Jonsson and she is something else altogether. Only in the movies have I ever seen a woman that is 80 and looks and acts 50 but here she is. The thing about Gun is it is all natural – no plastic surgeries or trout pouts, nothing fake, a few lines but they do not detract from her beauty, just a woman comfortable in her own skin with hutzpa and vivaciousness, oh I hope I take after her in the “getting old” department! If that is what getting old means we have nothing to fear at all. She was a chorus girl in her day and a former Miss Stockholm Lucia before she got into acting and has been held dear by the Swedish people and even received a medal from the King and Queen of Sweden for her services to the Arts just recently. 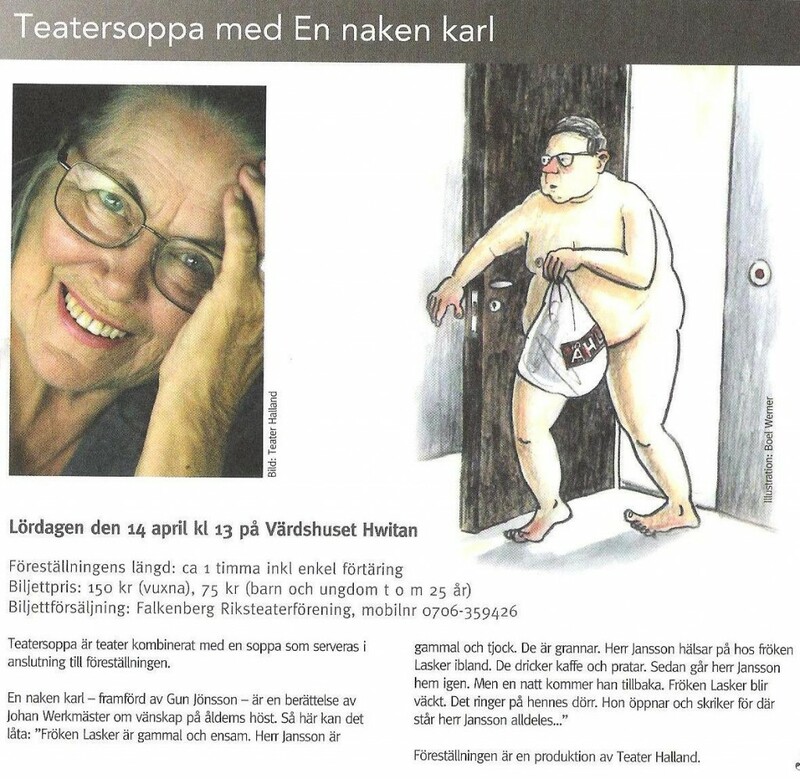 If you fancy reading more about her and my fathers upbringing in Sweden in the Circus here is an art blog about that; 20. Antonis Tivoli Art and 21. Life in a Circus Tent . Guns most recent engagement was at the theater in Falkenberg where she presented “A naked man” a story by Johan Werkmaster about friendship in life’s autumn. Perhaps on reflection it is from my aunty my own fascination with sexuality comes from, lol. “Miss Lasker is old and alone. Mr Jansson is old and fat. They are neighbours . They drink coffee and talk. Afterwards Mr Jansson goes home again. But one night he comes back. Miss Lasker wakes up. Her door bell rings. She opens the door and screams because there is Mr Jansson totally…..
Shame it was not still playing when we were there as it sounded right up my alley! Anyway back to the gathering, we were also joined by Gun’s son and my cousin Mikael Lind who being the fruit of two actors, his father is Lars Lind, couldn’t help but also getting involved in the limelight in one way or another. Mikael has for the last 20 something years played on cruise ships with his band where he plays the drums. Just like my brother in his band the Clowns of Decadence 25. Shake Rattle and Roll & Art & Music The next generation has also followed in this path with Mikael’s son and daughter enjoying some showbiz accolades through acting and music. The other people present this day was my gorgeous cousin Sonja and Per-Ove who also have lived a very interesting life. Per-Ove was an agronomist and Sonja taught in schools among other things and they lived together in several of the African countries. Their main objective was to help the poor pull out of their circumstances and learn alternatives to conventional agriculture, aiming to produce crops in a sustainable way. Couple this together with their stories about living life in Sweden and alternating that with living in third world countries and you have conversations which was just fascinating. We then spend the next day on tour with them being shown Gothenburg through Per-Oves eyes who was born there and told stories to transport you back to when he was a little boy, a wonderful and enriching experience.